Help scopes allow you to restrict the scope of a search and limit the topics which show in help contents. In the help view help the active scope only affects search results, in the help browser it also affects the table of contents and keyword index. A scope can be defined to include only specific books or topics from the table of contents. If the documentation set has been configured to allow scoping by criteria it is possible also to define scopes which satisfy specific criteria such as "platform" = "linux". From help contents the scope is changed by clicking on the link labelled "Scope" next to the search type in area. This opens a scope selection dialog, click "New ..." to create a new scope. 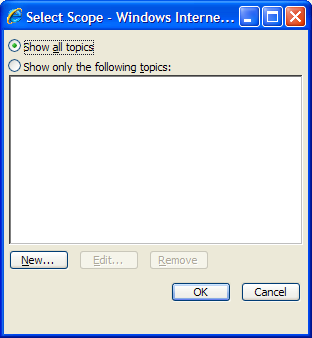 This opens a new scope dialog which allow you to select which topics to show. 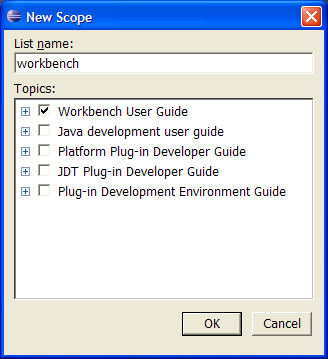 If the documentation set does not support scoping by criteria the dialog will be similar to the one below, in this case only the topics in the Workbench Users Guide will be shown. If the documentation has been set up to allow for scoping using criteria an additional set of checkboxes is displayed to the right of the topic selection area. 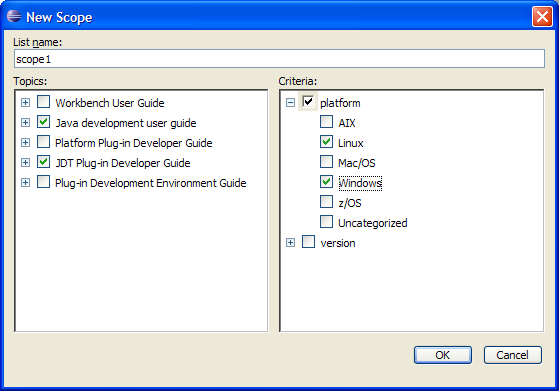 In the screen shot below the documentation set has two criteria which can be used to define a scope, platform and version. In this example the scope would include all topics which were in the one of the two books on Java Development and which were identified by the documentation writer as being applicable to Windows or Linux.